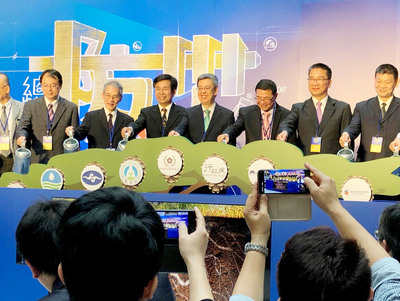 Taipei, May 13 (CNA) Construction of the first phase of the light rail system in Tamsui District in New Taipei is 30.95 percent completed, the city's Department of Rapid Transit Systems announced Friday. Work began on the 9.52-kilometer first phase of the project in September 2014 and is scheduled to be completed by the end of 2018. The department also announced the Chinese names of the 14 stops to be built in the current phase of the project, but the English names have yet to be decided. The tram system's first phase encompasses 14 stops on two tram lines -- the Lushan (Green Mountain) Line, which has 11 stops, and the Lanhai (Blue Seaside) Line, which has three stops. The Lushan Line starts from the Hongshulin metro station and runs along Zhongzheng East Road, Provincial Highway No. 2, Binhai Road and Shalun Road, and ends near the Danhai New Town project. The Lanhai Line, meanwhile, shares the 1.21-km section of track and three stops along Shalun Road with the Lushan Line before going in the other direction on Binhai Road and ending at Fisherman's Wharf by the Tamsui River. The first phase is being built by a consortium led by the government-invested China Steel Corp. The department said it plans to unveil the cars to be used on the tram lines, which are being built locally by Taiwan Rolling Stock Co., by the end of this year. The total budget for the Danhai light rail system, including a second phase to extend the Lanhai Line along the Tamsui River between Fisherman's Wharf and the Tamsui metro station, is NT$15.3 billion (US$468.78 million), according to the department. As of April, the total population of Tamsui District stood at 163,141, according to city government statistics.